Read the New Americans Campaign Best Practices Toolkits. Learn how the Campaign innovates using technology like Citizenshipworks, video chat and instant messaging to reach more LPRs. Take a tour behind some of the Campaign’s workshops. Partnerships with professional sports teams can be a powerful way to share the benefits of citizenship and encourage lawful permanent residents (LPRs) to apply for citizenship. Numerous New Americans Campaign (NAC) partners have built relationships with professional teams that have benefited Campaign partners, their volunteers, and potential applicants alike. This toolkit describes the benefits, processes, and outcomes for non-profit organizations of partnering with professional sports teams. 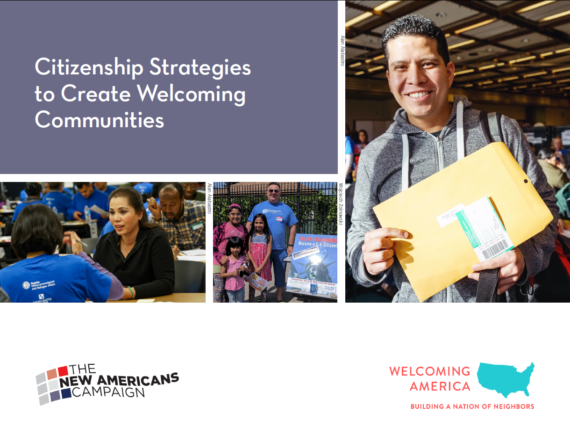 This toolkit was developed by Welcoming America and the Immigrant Legal Resource Center to provide promising practices and suggestions to engage receiving communities at the intersection of citizenship and welcoming work. Receiving communities are comprised of both established immigrants and non-immigrants. Informing this toolkit are lessons from demographically and socioeconomically diverse communities across the United States that are building receiving communities engagement strategies into their citizenship work and using citizenship as an effective avenue for creating immigrant and refugee-friendly environments. This toolkit was developed by OneJustice and the Immigrant Legal Resource Center to help immigration services providers nationwide leverage the enthusiasm and skills of volunteer attorneys at naturalization workshops. It is designed to help organizations and collaborations carry out naturalization workshops that include pro bono attorneys as volunteers. The focus of this toolkit is pro bono attorneys who are not immigration attorneys, although many immigration attorneys also donate pro bono time. At the end of this toolkit are sample materials to supplement an organization’s existing tools or benefit organizations who are new to running naturalization workshops. This guide provides an overview of best practices and service delivery models for nonprofit partners who would like to use Citizenshipworks to implement more efficient, applicant-driven naturalization services in order to increase the number of applicants they serve and reduce costs. It also includes an overview of the Citizenshipworks mobile application. Like American society at large, America’s LPRs are diverse. They come from over a hundred different countries; they live in rural, suburban, and urban locations; they have a wide range of literacy and education levels; and they speak hundreds of languages. NAC partners navigate applicants’ experiences and proficiencies as they provide naturalization services across the country. The best practices in this toolkit help partners serve a broad range of applicants while not sacrificing efficiency. Volunteers are a critical component of efficient naturalization service delivery, especially in group processing workshops, which the New Americans Campaign promotes. This toolkit provides recommendations for organizations on how to recruit, train, retain, and effectively use volunteers at group processing workshops. The New Americans Campaign provides a significant percentage of naturalization services through group processing workshops – events serving 10-600+ lawful permanent residents (LPRs) within a single day. This group approach is critical to the Campaign’s goal of significantly increasing the number of LPRs who complete their naturalization applications. It also serves as a foundation for other immigration service delivery, including future opportunities arising out of Comprehensive Immigration Reform. This toolkit provides recommendations for organizations on how to screen LPRs before a workshop for their eligibility to naturalize, as well as how to review the suitability of their case for assistance in a workshop setting. The New Americans Campaign’s unique structure uses site leaders to lead the campaign in each community. This toolkit illuminates the characteristics of a successful site leader, so that collaborations can appropriately choose which organization, and which person within that organization, should serve as the local site leader. Many partners in the New Americans Campaign who provide naturalization assistance to lawful permanent residents will expand their services to individuals eligible for the administrative relief programs announced by President Obama in 2014, including the expanded Deferred Action for Childhood Arrivals (DACA) program and the new Deferred Action for Parents of Americans and Lawful Permanent Residents (DAPA) program. Naturalization application assistance is a critical element of immigrant integration and the core focus of the NAC. This document contains best practices for NAC partners to successfully maintain their naturalization work while also assisting DACA/DAPA clients. These specific recommendations come from NAC partners who have found success in their current or previous work with DACA and other immigration benefits.